Well, in a matter of a few weeks we watched Bluebirds in our area go from collecting in large groups at bird baths and feeders, ( like this picture taken on my deck at home) to bluebirds being quite territorial and claiming nest boxes (like in the image below taken by Board Member Ann Smith at her home in Sullivan). I am looking forward to this year’s conference in Springfield where everyone can share last year’s nesting results along with their stories from this past winter. I for one had a good nesting season and a fantastic winter with the most Bluebirds I have ever had at one time. With the lack of natural food and the long stretch of below freezing temperatures, I had 10 to 20 Bluebirds frequent my deck every day for fresh water and snacks during February. The conference is such a good time to talk with others about their trails and share achievements. One thing I always enjoy at the conference, besides meeting up with old friends again, is the outreach that Bluebirds have in Missouri. Missouri has such an accomplished history of Bluebird conservation and we are benefiting from the years of dedication of garden clubs and individuals. The Bluebirds we see every day are a result of their dedication to conservation and what we do now on our Bluebird Trails is a part of the future for Bluebirds. 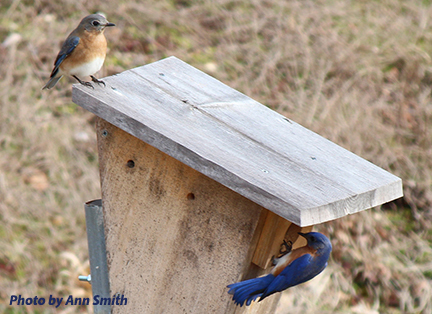 As we continue to care for bluebird boxes in our yards and on our trails, we are continuing the tradition of Bluebirds in Missouri. Thank you for your continued dedication to helping Bluebirds. I would like to give a special thank you to all who helped out and volunteered at the 2014 Missouri Bluebird Conference. We definitely have a special group. There were also members behind the scenes that also need to be thanked. They donated products for the auction / raffle or sent snacks and deserts with other members. Because we had so many volunteers there was always a helping hand when we needed something done. This conference was definitely all about Bluebirds and how we can help them. It all started Friday evening with the Bluebird Banquet, the “Bluebird and Friends” slide show (thanks to everyone who sent in their pictures) and the presentation of Awards to very deserving MOBS members. It was a pleasure to present Russ Heindselman the MOBS “Bluebird Conservation Award” and Norm and Beth Stucky received the MOBS “True Blue Service Award” for outstanding service to the Society. We all enjoyed a fun and very special presentation by Bet Zimmerman Smith: “Bluebird Oddities”. Saturday morning, Bet was again a joy to hear and her coverage of controlling House sparrows, House wrens and paper wasps was not only educational but very entertaining. We all appreciated Bet’s extensive perspective as a result of personal experience, but also the far-reaching source of data provided as a result of her educational website: www.sialis.org . We thank Bet for doing double –duty at our Conference this year with two special programs! With sixty years of experience Russ Heinselman has seen almost everything pertaining to Bluebirds and he shared with us just some of the inventions he made to deter unwanted guest on the Bluebird Trail. Then lunch, and what a lunch we had with many mouthwatering deserts prepared by our members. Each year I enjoy the cooking talents of our members. After lunch some of the ladies who had prepared just a few of the delicious deserts showed everyone how easy it was to prepare suet and treats for your Bluebirds. Regina, Mary and Ann, with assistance from Susan, made some of their favorite treats for their Bluebirds and many in the audience took home samples for their Bluebirds. Steve Smith covered many of the different Bluebird nest boxes and the reason for their design. He could have spent hours covering all the design features and there were many functional designs on the raffle tables that he didn’t have the time to cover. One of the main things that he covered was what to look for in a good nest box for Bluebirds and answered every question with personal experience. With this conference being so much about helping our wonderful Bluebirds it was a joy talking about predator control. When I put up a nest box I want it to be a house not a restaurant for predators. Ivan Ray Miller and Steve Smith helped me prepare the parts needed for the baffles. With the parts cut and drilled it made it simple to make 6 baffles for the MOBS grant box Bluebird Trails. We will be adding a page to the MOBS website with instructions for the new “MOBS Snake and Raccoon Baffle- Kingston Style”. During each break participants had the opportunity to bid on the many auction items and of course stop at the refreshment tables and get energized. For the last three years Larry Dobson and his wife Mary have handled the auction and raffle. This is MOBS’ only fundraiser and it allows us to keep the price of the conference down and invite such excellent speakers and Bluebird authorities like Bet this year. 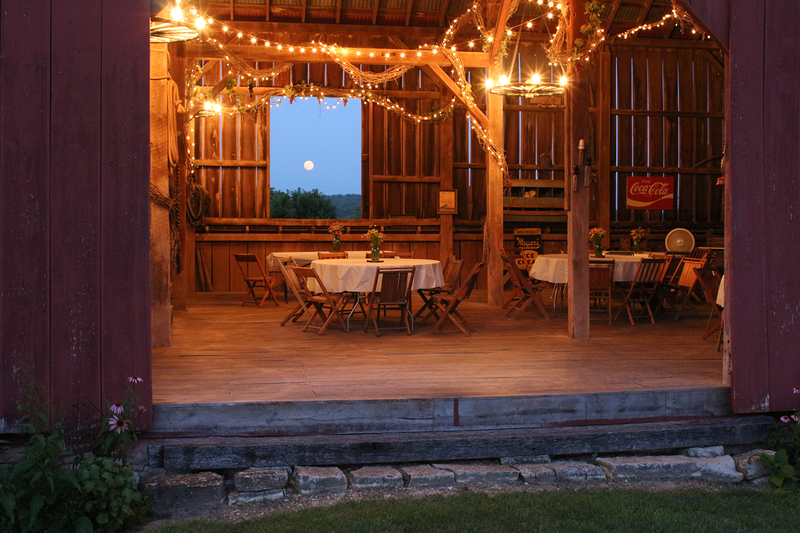 This was our first time to plan a Saturday evening event as part of the Conference and, thanks to the generosity of our hosts Norm and Beth Stucky, it was an enormous hit! Norm ordered up just the right amount of breeze to cool us off during the weenie roast, and Beth made “Killer Baked Beans” and put on a spectacular spread to go with our hot dogs and S’mores. They capped it off with a beautiful moon. Just when we thought the Saturday evening social could not be topped, the Sunday morning field trip proved to hold even more fun and learning opportunities. We all toured the Stucky’s beautiful wildlife habitats and were entertained by their Bluebirds, Purple Martins, Orioles, Woodpeckers, Hummingbirds, and even a Mississippi Kite during one of the bird walks! (special thanks to Audubon member Betty Richey for leading that last bird walk around the wetlands!). In all, we spotted 47 different species on our Sunday field trip to Mockingbird Hill! Our goal at MOBS is to help everyone with their Bluebirds and other native cavity nesters and the conference this year definitely fulfilled this ambition. Again, I personally thank everyone for so generously giving of your time and effort to make this an educational – and unforgettable- Missouri Bluebird Conference! What an interesting Spring we have had here in Missouri. It seemed as though Spring just would not get here and stay with us! Of course, this means the start to nesting season has been very different than last season. This time last year many of us had eggs hatching. This year it seems some of you have eggs hatching while others have birds just now selecting a box and putting in nesting material! Who knows what the rest of the season holds. I can tell you, however, about a few things sure to be helpful to all bluebird- ers: Please take a few minutes to look over the information in our newsletter on the new “House Sparrow Project” . I am sure many of you could provide valuable information to this study. Also, Please be sure to note the information Steve Smith has submitted on the upcoming MOBS Field Trip in June. I know I plan to be there and am sure I will learn a lot. Of course, you’ll also want to hurry and send in your Registration for the 2013 Missouri Bluebird Conference (July 12-14th). There will be so much to discover at this years conference to benefit all of us AND our native cavity nesters. Plus, the gorgeous Powell Gardens is a terrific setting and the planned field trips and programs are sure to provide valuable data, great experience, and wonderful camaraderie with other Bluebirders!